Kaeng Krachan Country Club and Resort is good round of Golf but the highlight of this course is the beautiful Natural scenery. Featuring forests, lakes and mountains it’s a must play for nature lovers as the designers have preserved a lot of the natural terrain. The original 18 holes are fun to play but favor accurate shots off the tee and the greens can be a little tricky. The new 9 designed by Jack Nicholas is a lot more demanding and boasts some of the most dramatic elevation changes in Thailand. All in all this is a great course too play for all skill levels. Why You Should Play Kaeng Krachan Country Club and Golf Resort? The Nicklaus Mountain nine is a must play as it was built to international standards and is one the best conditioned 9 holes in the Hua Hin area. 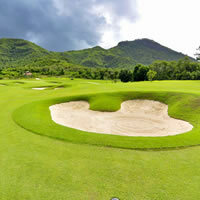 Notes: Well suited for Hua Hin golfers looking for change and a golf course off the beaten tourist tracks.